New Lazy Susan Hand Painted Farmhouse Furniture Have Arrived. Check these Lazy Susan’s out in my Etsy Shop today! The background is a creamy white slightly distressed and hand painted with watercolor garden flowers. Did you spy the dragonfly? Find hollyhock, coneflower, butterfly bush, bee balm and poppy to name a few. The palette is a leafy green, soft pink and red, blue, purple with a wash of soft brown stain, rubbed back so you hardly notice it, over it all. There are several coats of clear lacquer. Check this one out here! Custom hand painted 15 in wood lazy susan with garden flowers ready to adorn the center of your farmhouse table. Made to order. Order one with these beautiful flowers or change up the flowers to match your cottage decor. Maybe you have favorite flowers or a scene you like? Let me know I can work with you to create the perfect lazy susan just for you. The background is a creamy white slightly distressed and hand painted with watercolor garden flowers. Did you spy the bumblebee? Find thistle, coneflower, delphinium, wildflowers and bumblebee to name a few. The palette is a leafy green, soft pink, blue, purple with a wash of soft brown stain, rubbed back so you hardly notice it, over it all. There are several coats of clear lacquer. Check this one out here! Lazy susan measures 18 inch or 15 inch diameter and a nice full 1 inch thick. I use a high quality ball bearing lazy susan mechanism that moves quietly and smoothly. Able to hold 200lbs. I add protected round tabs on the bottom to protect your surfaces. You can grab one of these up now with no waiting if you like. Please allow 3 – 6 weeks to complete your lazy susan once the order is placed and design is confirmed. Printed Flower Pillows for Farmhouse Decor. Looks great on sofa chair rocker or favorite bench, love it. Throw Pillows upgrade your home decor with trending patterns, color pops and one-of-a-kind designs. And these pillows aren’t just decorative: we made sure they’re fluffy enough for naps too. Try searching for other florals and nature designs you’re into for the perfect accent to your space. Add this amazing farmhouse painted furniture decor accent. Garden flowers wildflowers and herbs are painted in watercolors and ink all over this custom handmade botanical box. I painted tons of different flowers on this one of a kind keepsake box and what a statement this small chest makes. There is the soft hue of a summer sky with botanical designs on the top and on every side. There is slight bit of hand rubbed distressing to give this chest a farmhouse worn look. Measures outside 14.75″ x 11.5″ x 8″ high. inside 12.75″ x 9.75″ x 6.5″ high. The sides of this nature box are 1/2 stock poplar with mortised hinges. Blue bachelor buttons, mint, asters and larkspur in a watercolor original botanical garden nature art painting. 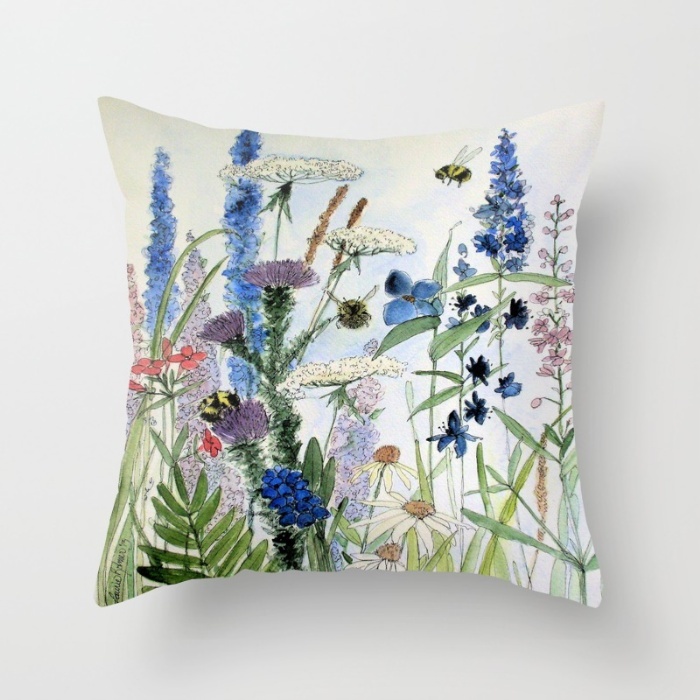 Wildflowers and garden flowers in shades of blues and lavender with sprigs of green grass. The title of this whimsical painting is Blue Buttons by Laurie Rohner. Each flower is painted by hand and then I apply ink. This is a delightful whimsical botanical illustration and is affordable. Flowers are painted all over this framed mirror. The frame is hand painted with an array of flowers from reds, pinks, purples and blues. There is a bumble bee and can you find the dragonfly? A 3 1/2″ pine wood frame is painted, varnished and the entire finish is sealed with a butcher wax. Crafted by my own hand. It is ready to hang. Flowers are painted all over this frame/mirror. Overall dimension is a 15″ square and the mirror is an 8″ square. Shop at Between The Weeds Marketplace. Farmhouse Cottage Shabby Chic Furniture with New Botanical Illustrations. Distinctive Farmhouse Cottage hand painted furniture, farmhouse style custom made home decor, shabby chic, inspired by nature, hand painted by Laurie Rohner. Nature and botanical flower designs on farmhouse painted furniture and shabby chic home decor created on handmade custom work, sometimes slightly used furniture once forgotten, now given a new purpose. The Painted Cottage Home is filling up with wonderful new watercolor painted furniture. This great new work is whimsical and distinctive. I know you will like it. Hand painted garden clay pot with blackberries and bees adorns this fabulous one of a kind painted gift. Custom painted for the gardener in you. Gardening does not stop because the weather changes. This pot is painted to give the illusion of moss. The blackberries spew over the sides and are in shades of blue purple and red. The leaves are a mossy green. Great for plants or use it for the holidays with some fresh greens, fruits, or cones. Ask about fresh boxwood and I will happily send some with your order. Check out my custom garden gifts at Whitefield’s by Laurie Rohner Studio. Check this out! Love it. Printed pillow art for farmhouse homes.